The immediate past Secretary to the Government of the Federation, Babachir Lawal, says he is happy with the manner with which he is being investigated by the Economic and Financial Crimes Commission. Lawal, who was sacked by President Muhammadu Buhari on October 30, 2017, after being probed by a committee headed by Vice-President Yemi Osinbajo, said he was confident that the EFCC would get to the truth. He said this during a programme on Channels Television titled, ‘Hard Copy’ which was aired on Friday. Lawal, who was accused by the Senate of allegedly awarding one of his companies with a grass-cutting contract to the tune of N223m, said the EFCC, being a neutral entity, would uncover the truth. He said, “I like it (EFCC probe) because the EFCC has the capacity both in equipment and personnel to get to the truth and they are expected to be impartial. They are not politicians so they will get to the truth. 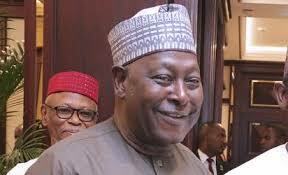 The former SGF said despite his ordeal, he was still close to the President. He added that he and Buhari as leaders of the All Progressives Congress, still met on a regular basis. The former SGF also explained what he meant by the question, ‘who is the Presidency?’ when he was accosted by State House correspondents at the Presidential Villa shortly after his dismissal. Lawal said it was not in the character of Buhari to announce the sack of his appointees before informing them in person. He, therefore, said he was surprised to hear the Presidency had sacked him when he was in fact in charge of announcing appointments. Lawal, however, stated that he expected an explanation from Vice-President Yemi Osinbajo before his removal.